The watch crystal on your favorite watch has become so scratched you can hardly read the time, what now? Don’t throw away your watch! 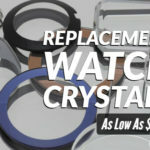 You can easily learn how to remove a damaged watch crystal with a heat gun using this guide. WARNING: this repair involves tools that operate at high temperatures. 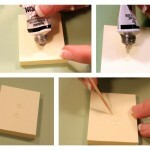 Use caution when attempting this repair and see a professional if you are unsure at any point. 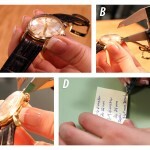 You can ONLY use this method if your watch case and band are both made completely of metal. NOTE: If there is a gasket holding the crystal in place, do not attempt to use a heat gun. 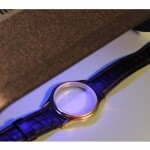 Set the watch case down on your heat resistant surface with the watch crystal facing up toward the ceiling. 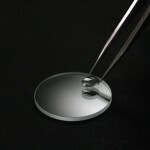 Turn the heat gun on and hold the tip between two and three inches away from the watch crystal. Hold it here for about a minute and thirty seconds. NOTE: If the anything on the watch or crystal starts to smoke and turn colors you should remove the heat gun from the watch immediately. After you have heated the crystal for a minute and a half, set the heat gun aside and grab the watch crystal with your hot pad. Be sure that you do not touch the metal of the watch or the crystal with your bare hands. Quickly turn the watch case over so that the back is facing the ceiling and push the crystal out of the front of the watch case with your thumbs. When the crystal pops out, set it and the watch aside to cool down to room temperature at a natural rate. Once the watch case has cooled you can take your flat head screwdriver and gently scrape any remaining glue from the ledge of the watch case. I adore the Esslinger site,because every advise is very useful and simple to understanding and You give the answers for all questions ,with Esslinger I love my watch even more than before ,because I understand them better! Thanks so much for Your’s work!